Cardiovascular disease is the number one cause of death of both men and women. Cardiovascular disease refers to a metabolic state that leads to narrowing or blockage of the blood vessels, which can cause strokes and heart attacks. Chronic inflammation is currently thought to play a major role in the etiology of cardiovascular disease. Regular exercise, maintaining a healthy weight, and eating a heart-healthy diet can prevent and even reverse the onset of cardiovascular disease. 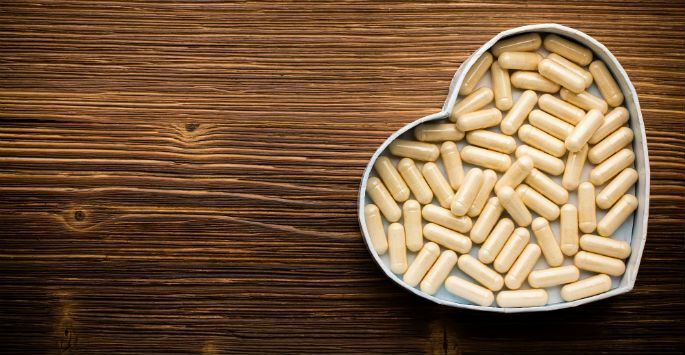 Many people would like to be even more pro-active with their heart health and take supplements to support its function. Fish oil, a good source of omega-3 fatty acids, has a strong anti-inflammatory action. It has been shown to reduce deaths from cardiovascular disease. It can also help prevent cardiovascular disease from developing. For individuals who have started to develop cardiovascular disease, it can reverse the symptoms. In addition to reducing inflammation, it can lower blood triglycerides (a marker of cardiovascular disease) and reduce blood pressure. Green or black tea, whether drunk as a beverage or taken in capsule form, appears to be able to reverse many of the markers of cardiovascular disease such as elevated LDL (bad cholesterol) and elevated blood pressure. Some studies suggest that regular green tea consumption can reduce the risk of death from cardiovascular disease. Garlic, whether eaten fresh or consumed as a powder in capsule form, has many beneficial effects on cardiovascular health. When taken regularly, it has been shown to reduce both LDL and triglyceride levels. Coenzyme Q10 is an antioxidant that is naturally synthesized in the body. Individuals with cardiovascular disease are often deficient in coenzyme Q10. Statins, prescription drugs often taken by individuals with cardiovascular disease, seem to lower coenzyme Q10 levels. Many people suggest taking coenzyme Q10 to help with cardiovascular disease. However, the evidence is mixed as to its efficacy. Some studies report a helpful effect on LDL and blood pressure, and others find no effect. Individuals who have been tested and found to be deficient in vitamin D should consider taking a supplement. Some studies have found a link between vitamin D deficiency and cardiovascular disease. Niacin is a B vitamin. Taken in high doses it can increase HDL (good cholesterol) levels. However, it also causes a lot of side effects. It increases the risk of bleeding, diabetes, stroke, and liver disease. Patients should consider the risk/benefit balance carefully before choosing to take niacin. These vitamins are powerful antioxidants. At one point in time, people were touting them as a cure-all for many conditions. However, several large studies found that taking these vitamins regularly at high doses was not beneficial, and was actually harmful to health and increased overall mortality. At NanoHealth Associates in Hollywood, FL, we work to treat and prevent cardiovascular disease and other health concerns. Our medical team will work with you to determine the safest and most effective supplement and treatment plan for your needs. Contact NanoHealth Associates today to schedule your consultation.